World of Turbo: No Snow! Is that the kind of art you do that your moms so proud of you for doing it that it gets put on the fridge? Oh sorry no snow. I love snow. Snow is fun. haha I like your art work. I think we might still get some flurries here ...... but starting yesterday afternoon, I called off anything more. Every time we went out, mom said, "What do you think Am? Is it coming?" And I said, "Not much, maybe flurries." CATS! I want SNOW, lots of SNOW! Ender, I wish! But my Human is concerned with Lex's feelings. Peanut, thank you! I'm sorry you don't have snow, either. Amber, you tried! That's the important thing. Excellent artwork. You are very creative. 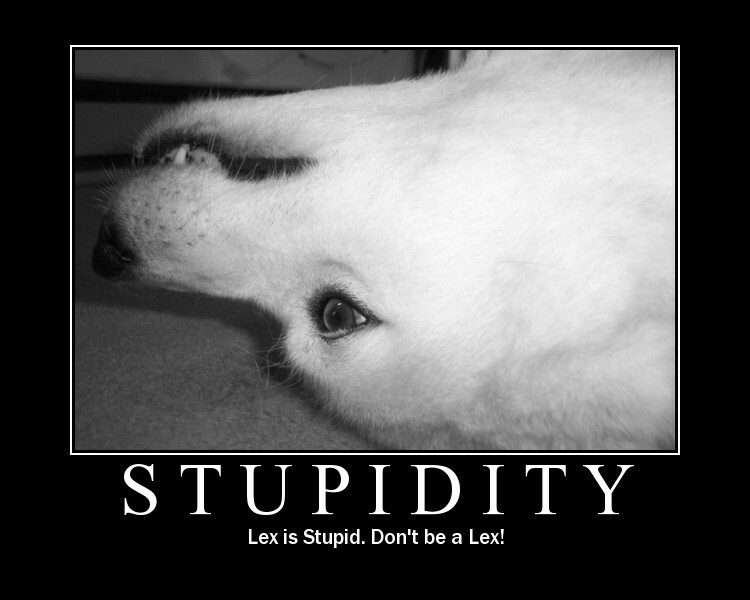 i luv your stupid lex poster! i printed it out and put it on my fridge! i hope you get your snow soon. maybe if we all think snowy thots together it will happen.... snow snow snow snow snow snow snow snow snow SNOW SNOW SNOW!!! Thanks to both of you, Althea & Ivy! Great poster Unkey Tubey. We like it. We wanted snow too, we have never seen snow. Thanks, young 'uns. I hope you get to see snow soon! I know it's late at night, but (Ha ha!) that's funny! "Don't be a Lex!" Ha Ha! P.S. Check out my November 8th post. I found another winter outlook site. They lie to us about snow here all the time. We're use to it. Those mean weather people get our hopes up, then.......nothing. Zero. Zip. Zilch. Nada. What I want to know is, how do they keep their jobs? Holly, humans are so stupid that they can't help but keep stupid ones employed. Hi Chiyo! Hot & humid weather is stupid!